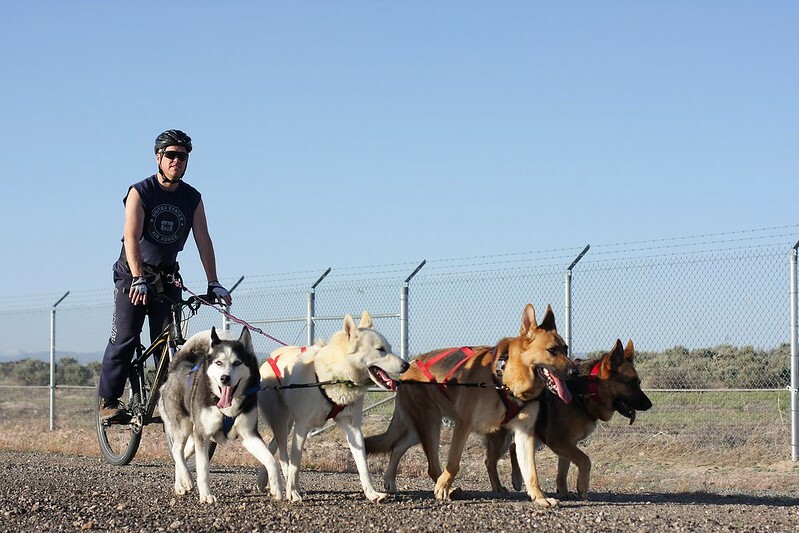 Finally, I have pics of all 4 dogs (2 Huskies + 2 GSDs) bikejoring together! 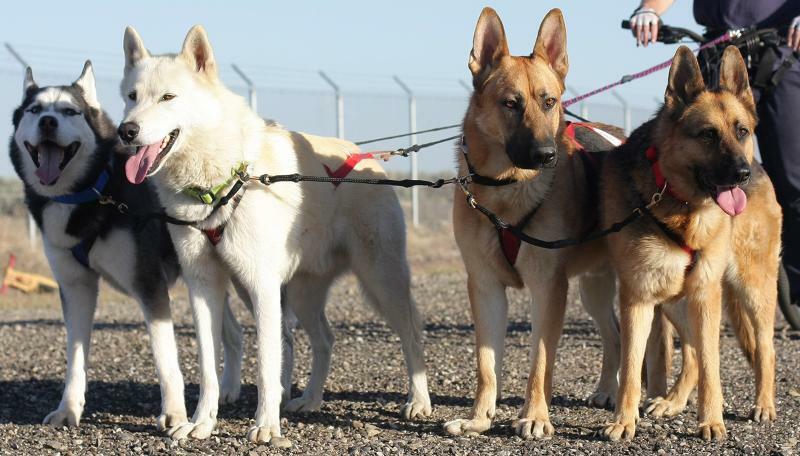 From left to right: Paw Paw, Beowulf, Kaze and Nara. Wow nice family photos, Kevin. You all look like you're having so much fun. Glad to see you also run, I was wondering how [i]you[i] got exercise with four puppies pulling your bike! As side note, are those shoes the single toe kind? what does that feel like? I've seen them and always thought they just looked weird. 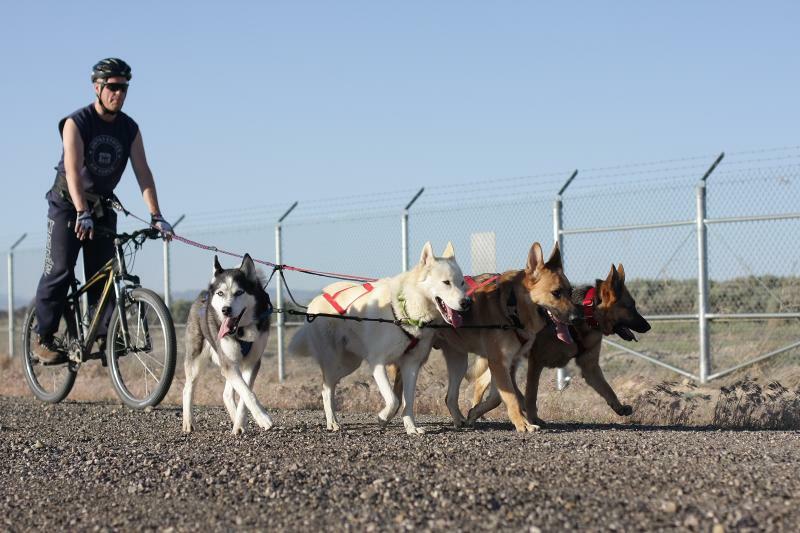 Glad to see you also run, I was wondering how you got exercise with four puppies pulling your bike! As side note, are those shoes the single toe kind? what does that feel like? I've seen them and always thought they just looked weird. 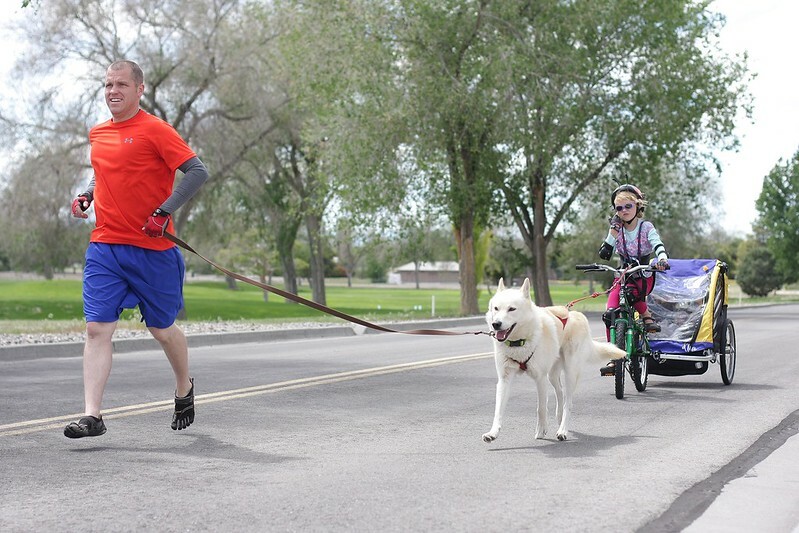 Yeah, the bikejoring is fun for me and exercise/fun for them. 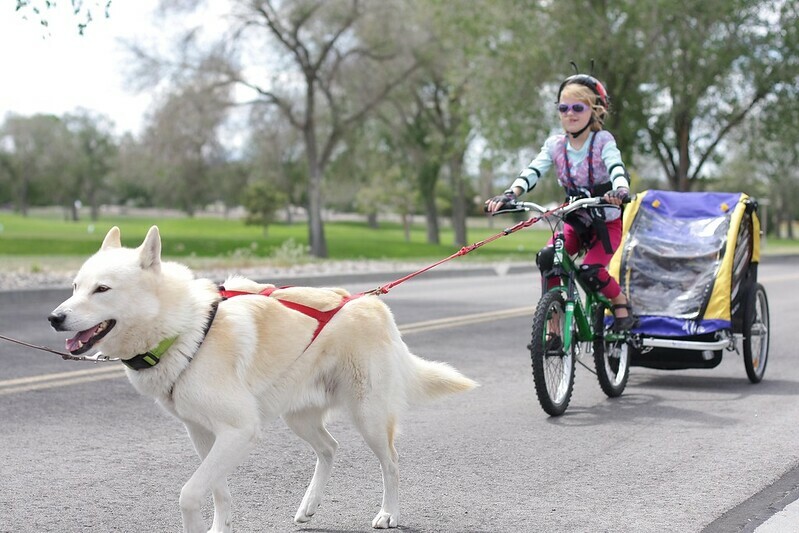 I have to keep in shape for my job, so I run by myself, or with 1 dog, or with the setup like in the pic of my daughter learning to bikejor. And yes, those shoes are the barefoot technology Vibram Fiver Fingers, aka "toes shoes." Haha! When I first saw them, my jaw probably hit the ground and I'm sure I did multiple double takes. I wanted to try them just to see what it was all about since they were so different from anything I'd ever seen, and I liked the concept. After doing some research and learning that our US Special Operations personnel were switching to wearing these for physical training, I KNEW I had to get a pair. If the shoes have passed the SpecOps test, then they'll probably be OK for me too. I'm almost 40 and am in the best shape of my life. I'm running circles around most of the younger 18-20 year olds. I don't even own a pair of "real" sneakers anymore. I have 2 pairs of Vibrams and am in the market for a new pair, as my first pair just got thrown out this week due to wearing holes right through the bottoms after running in them for 2 years. I get asked about the shoes all the time, as many people think they look funny, just like I did when I first saw them. I'll tell you a funny story though: when I first got them, before doing extensive research, I was told by another owner that you have to run in grass and trails, and not on the pavement like I was used to in regular running shoes. Well, my first time running through grass and weeds, I felt discomfort in my toes. I looked down as I'm running and realize that I've been clipping dandelions with my new shoes, and the weeds and flowers were getting stuck between my toes, forcing my toes to spread out farther and farther. There were actually yellow dandelion flowers between most of my toes. I looked like a hippy flower power child! Ha. I had to stop and pluck all of the flowers and tall grasses out from inbetween my toes before I could continue running. I eventually learned that you can indeed run on pavement in these toe shoes, and the rest is history. Car passing by must've thought I looked pretty silly with flowers caught between my toes though. Haha! I love these shots, wonderful to see a family out active together! Your new boy looks like he is settling in well with the rest, he is certainly a stunner How is he coming along with rescue training? Yup, Kaze has been working out well. He's doing great taking his beginner steps towards SAR training. He has a long way to go though. As for the active family...we don't own a TV, as we want our kids (and ourselves, leading by example) to be outside in nature and fresh air, surrounded by the wild animals and flowers, birds, etc. We would all much rather be outside, even in the rain or snow, than inside most of the time. Vibrams have been great. I played soccer/football for 30 years, plus ran long distance track, and only once in my life can I remember being sore from running. That one time was when there was a rainstorm with lightning, so we couldn't hold our soccer practice outside. Our coach made us run up and down multiple levels of stairs for an hour straight. It was grueling, and the most intense workout I've ever done. I run in the Vibrams an average of 5 miles a day, and I'm sore the next day just about every time so I know I'm getting in a good workout. You have to completely revamp your running style to run using barefoot technology, so you don't injure yourself, but it's more natural and actually works once you figure it out! And you're right, people do give funny looks. I have the solid black Flows, and people say they look like gorilla feet! Haha!! Do they work for people with sciatica? Hate getting old and never been a fan of sneakers/running shoes, I prefer walking/hiking with Miya. We moved from Tampa Bay, Florida to the middle of nowhere Texas for the same reason, no tv here, ate my first home grown peach with my husband today, it felt so rewarding. Not sure what that condition is, but I'm currently reading up on it and doing some research for you. I'll answer your PMs once I get some info. And yes, I've always lived in or near bigger cities or in the suburbs. We now live out in the middle of nowhere, near a town that has a population of 10,000, and that's only because of the military base. Boise is 45 minutes away. It's all just desert and farmland around here, peace and quiet, other than the occasional pack of coyotes howling, which is music to our ears. My wife sent me 3 more pics, and I cropped them to show the dogs up close. Enjoy! I love these! 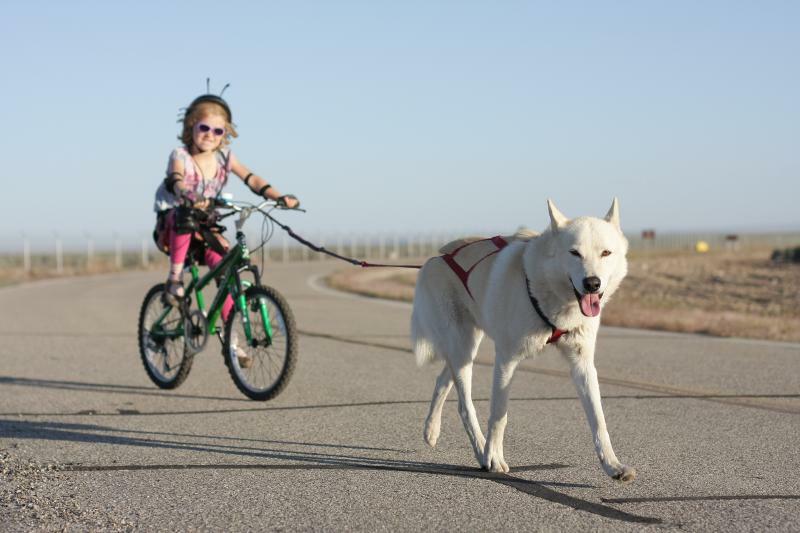 What a happy family, dogs and people, and I think it's great your daughter's getting into bikejoring so early. 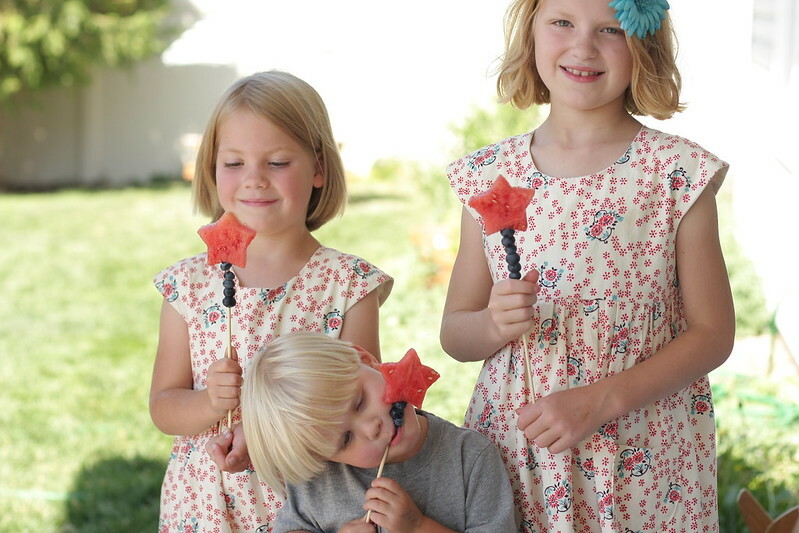 I wish I had been able to do something like this when I was young. 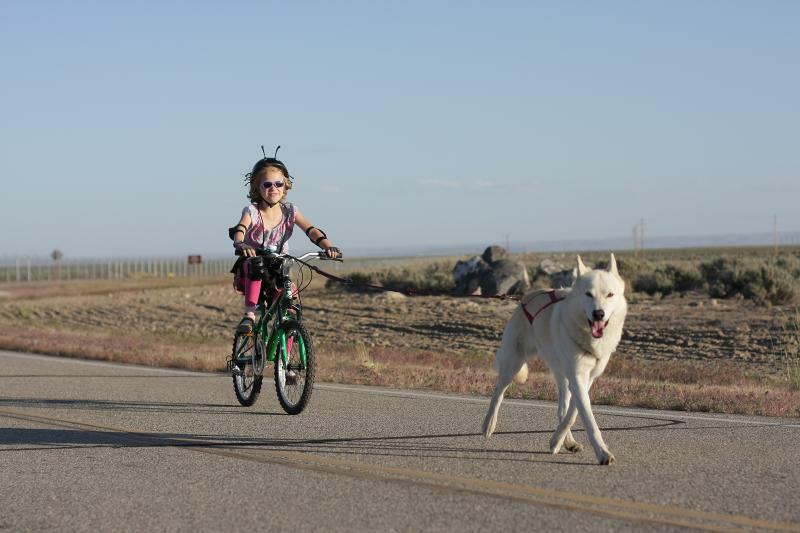 She's going to be an awesome musher when she gets older! So far she has gone 4 times. Twice with Nara, and now twice with Beowulf. The first photo with the canopy trailer was her first time with Beowulf. 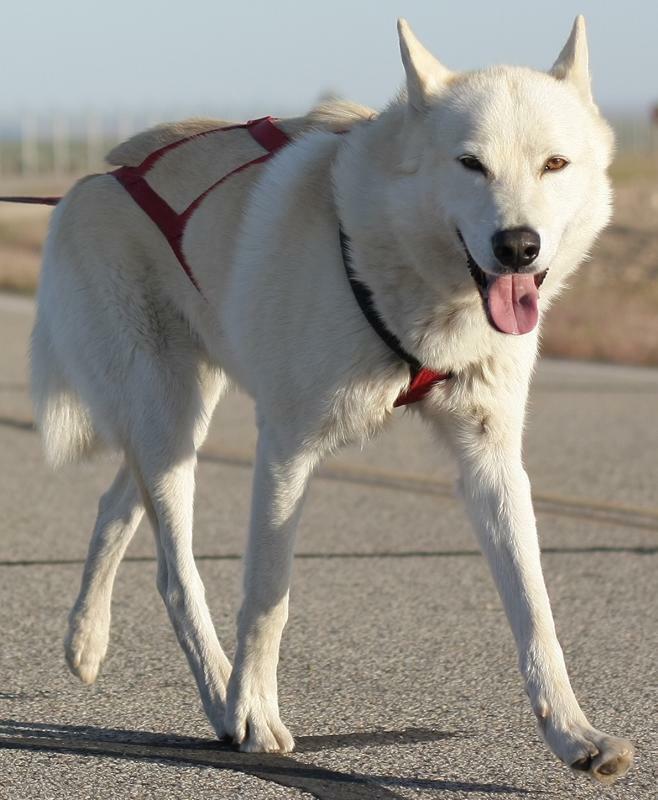 The newest pics without the trailer, and Wulfies off leash, were from her second time. 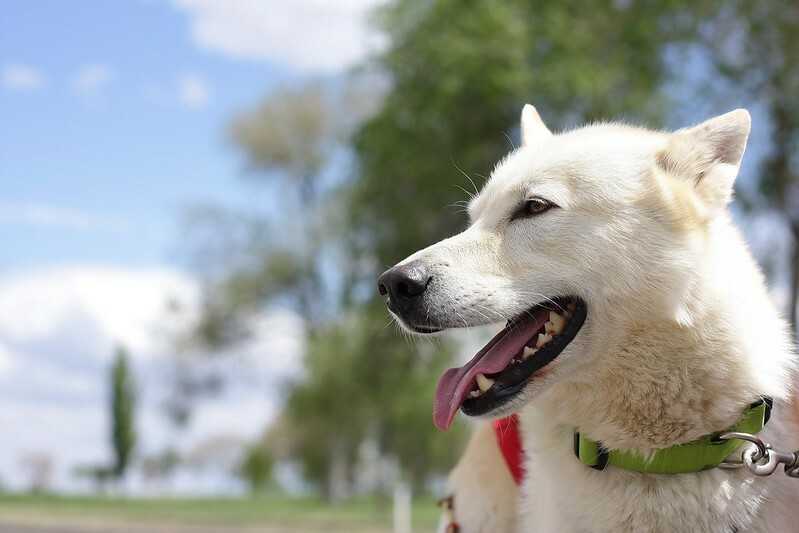 Next she wants to try Nara and Beowulf together as a dog team. I can't wait for that. 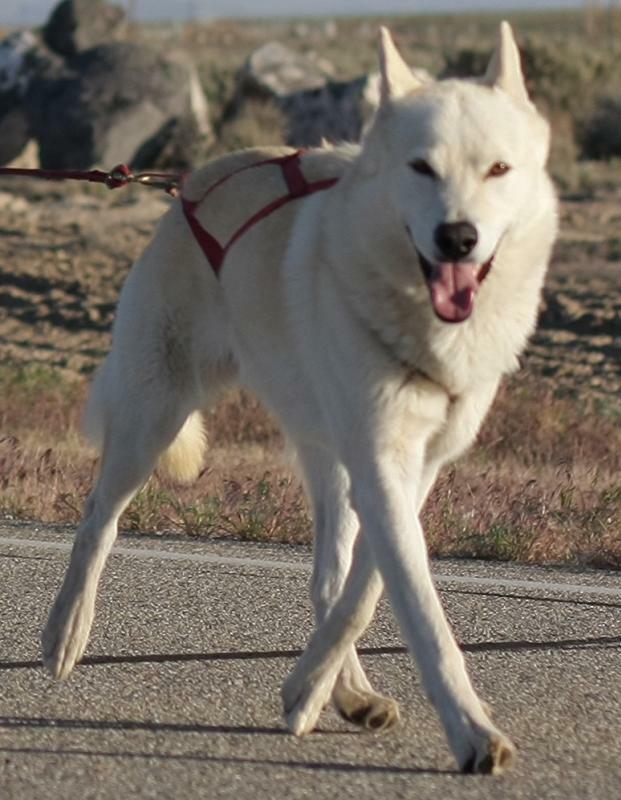 Then we're going to let her try with Paw Paw and finally Kaze, who is now our youngest and strongest puller/runner. 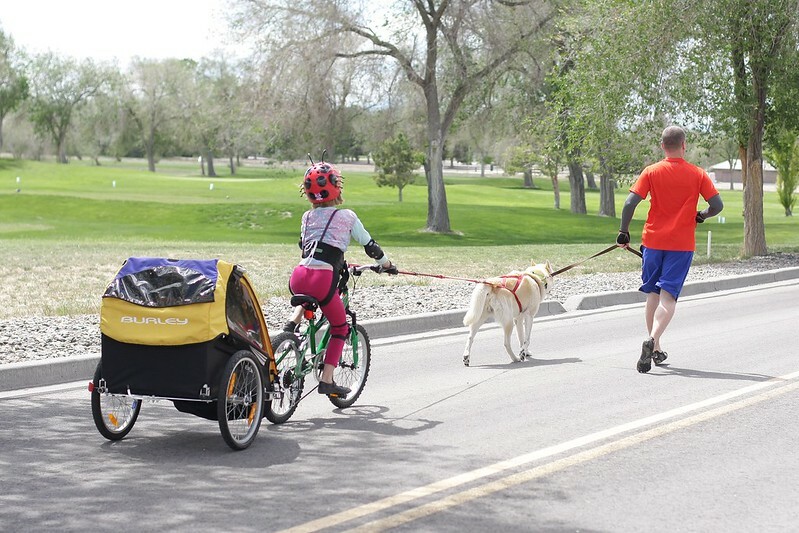 And as the years go by, soon enough it will be time to teach our youngest daughter and son to bikejor. I'm a lucky daddy! They look great! I can't wait to try out my new boy in harness and see how he does with the girls. I love the ladybug helmet on your daughter! 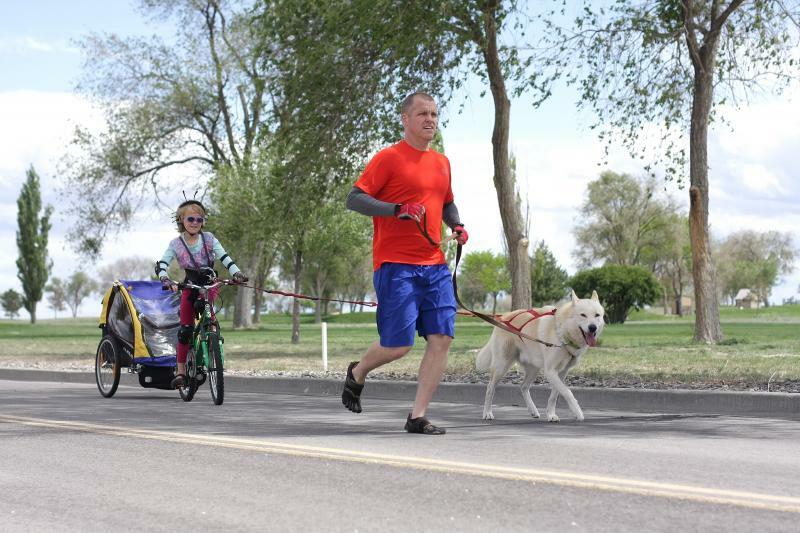 I'm sure to many people the sight of Beowulf pulling your kids with you running beside looks like an interesting parade, haha. Beautiful shots! I really like the pictures of all the dogs working together. Love the ladybug helmet too! Also love Kaze's face in this one. Everyone elses is all tired and happy, Kaze is like Where the f**k is the food. Similar photo from before, but this shows Nara at the end a little better, and it's before Paw Paw tried to run AT the camera to "steal the show." All (blue) eyes on me, says that Paw Pawzers! Just wondering is there any reason you have them in that "fan" formation and not like 2 by 2? My bikejoring mentor taught me to run them like this. The fan formation is how she runs her 6 Alaskan Huskies when she dog scooters. 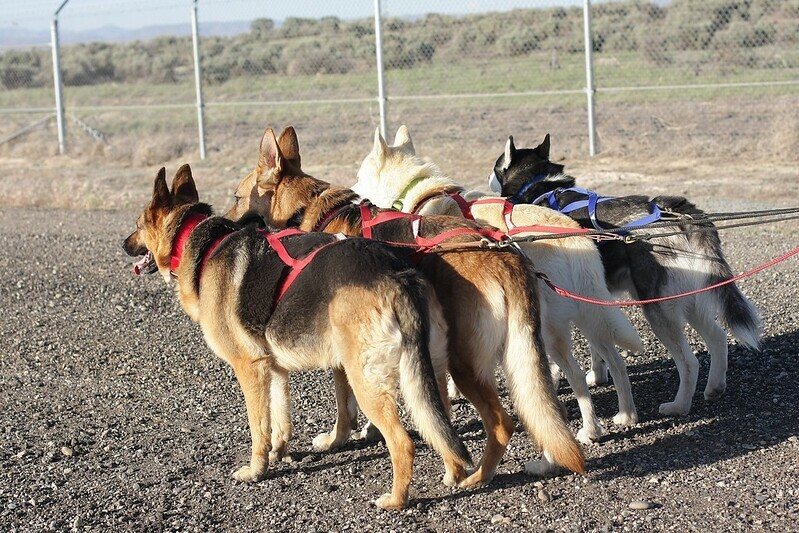 In my previous sled dog club, she was one of the top people with experience on this sort of stuff, so I stuck with how I was taught as I added a 3rd and 4th dog. Also, for us, it helps to keep them untangled and more equally competitive when it comes to sharing and distributing the workload of doing the actual pulling. I've tried to run them 2x2 and every time, no matter which dog I place where in the lineup, the 2 dogs in the back will outrun the 2 dogs in the front. If I brake to balance it out and slow them down, the 2 dogs up front will just stop running, or they'll all get tangled with each other. It was a complete disaster each time. 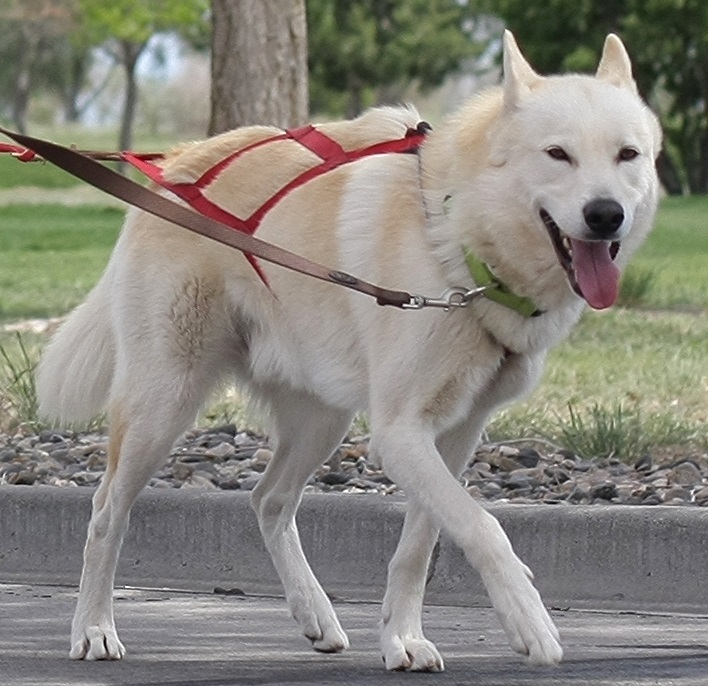 I have some ideas to try again, and I went back to that sled dog club to receive some solid training advice on how to correct the problems I'm having. I just haven't had time to work with the dogs on it yet. It's so convenient and time saving to just run like we're used to running, versus taking the extra time (that I haven't had with work and family) to train them 2x2. One day though! And when that day comes, I'll have pics to share of our breakthrough and success!! Hope that helps. Thanks for asking!! 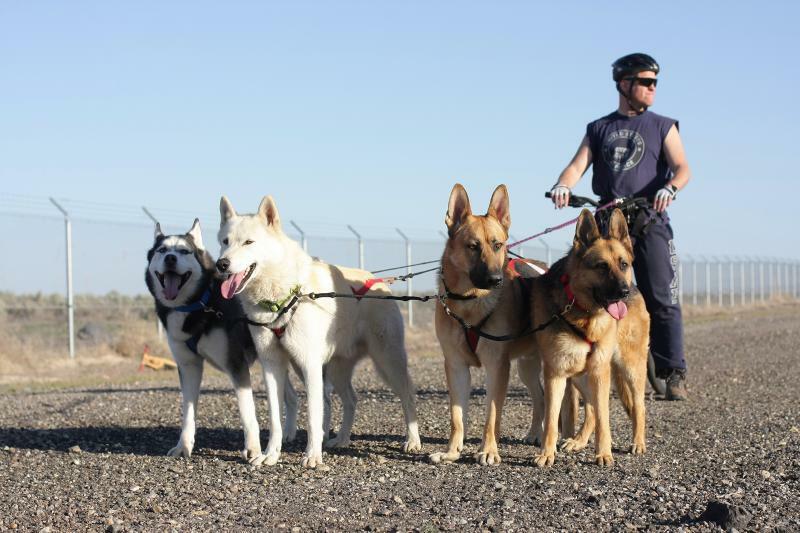 Subject: Re: Finally, I have pics of all 4 dogs (2 Huskies + 2 GSDs) bikejoring together! » Finally got my pics off my Blackberry!